Often times wine bottle capsules can be difficult to be removed by end-consumers. Sometimes, they even get injured by the capsule (small cuts). Furthermore, the capsule is cut in irregular shapes, which damages the image of the wine once it is open. roducers do not need to change their bottling line to incorporate this technology. 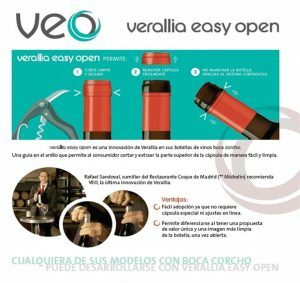 VEO makes for easier and safer opening of wine bottles as well as a better image of the bottle once it is open. In addition, bottlers don’t need to make changes in their bottling machine to adapt VEO.